Home > Shop by Category > Other Supplies > All Other Supplies(155) > Tube Wrap/Cover - 6' 6"
This tubing wrap goes over the ResMed tubing to help control condensation (rainout) of humidity for greater comfort. This tubing that is the same 6'6" length as the ResMed tubing. This is the only commercially available wrap I've found for the ClimateLine Air heated tube, which is an uncommon length at 6 feet 6 inches. I wanted the wrap because I like to sleep in a highly air conditioned room, so even with the heated tube I was getting rainout. This wrap fits the longer tube as advertised and seems to be high quality and well made, unlike many of the cheap fleece tubes I've seen advertised that just have velcro wrappers at the ends, no zipper. Those are a pain to put on and remove. This cover installs easily and quickly and is pretty heavy duty, fitting the hose like a fairly heavy winter glove. The outside is pretty soft and doesn't make a lot of noise when moving around on the bed. The ridges on the hose would always get caught on the wood rim of our bed, make a loud dragging noise, and wake my wife up (she's gotten spoiled now that I am on CPAP and no longer snore - haha). The only minor issue I've found with using it is its weight. 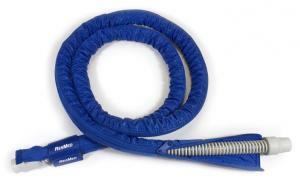 Because it is fairly heavy duty and well made, it adds significant weight to the hose. So, if you just let the hose hang off the side of your bed, it tends to pull your mask out of place and cause leak. Also, it makes the hose less flexible, so you might have to fuss with it a little more at night. I've found that you just have to "cuddle" with it a little more so it doesn't fall completely off the bed, or support it via a "tube management" rack.